Watch out, e-Commerce! The new Retargeting.Biz is here! Watch out, eCommerce! The new Retargeting.Biz is here! When it comes to eCommerce, you always need to keep up with the latest trends, in order to be one step ahead of your competitors. And here, at Retargeting.Biz, one of the best retargeting companies in the world, we are totally aware of this! First of all, Retargeting.Biz, a retargeting software that helps online stores grow their revenues through personalized and automated communication with their clients, is using a whole new database and a new architecture, leading to a faster processing speed and a way bigger processing capacity, enabling us to be prepared even for big eCommerce events, such as Black Friday! Next, we have a new retargeting algorithm which now uses more parameters, for a better output for every client. And yes, it helps us deliver even better product recommendations, so expect increased revenue and conversion rates when using our new retargeting software. Finally, our retargeting platform has a new and improved design and user experience, making it even easier to navigate. However, this is not all. We are aware that you want to know if we did something about our triggers and the answer is ‘yes’. Retargeting.biz brings a lot of new ones, perfect for your online store. 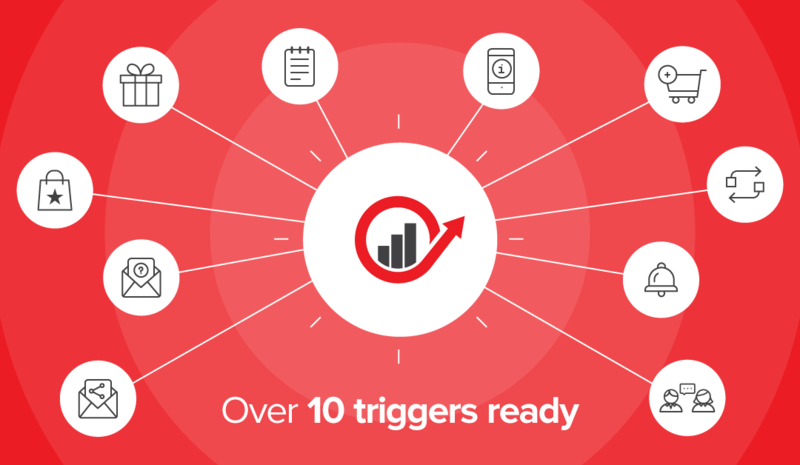 Enough with these retargeting details, let’s stick to the point and see what each of these new triggers can do! Cart Abandoned Related Products – This trigger seems that a potential client hasn’t finished the order and he or she is still not decided on what products to buy, so it offers him/her three suggestions, in order to make the decision easier. Is retargeting great or what?! Product of Interest – It spots a client’s favorite product and it reminds him that he should buy it before the stock is over. Cross Sell – After a client closes a sale, this trigger will automatically suggest a few complementary, personalized products. Basically, it tries to convince users to buy even more from you! Inactivity – This trigger can be considered one of the most efficient retargeting features, being able to detect if a potential client hasn’t visited your site in a while and sends him an email with all the new products. Tell a Friend – It’s simple. Everybody who refers friends to your website has a few benefits. Feedback – Clients are always helpful when it comes to improving a website’s overall experience. This trigger sends visitors a few questions about how they feel about your site. Happy Birthday! – Everybody loves presents! Using the database for retargeting, this trigger offers every birthday boy or girl a special discount! Social Sale – Another simple trigger, telling visitors that they are received the e-mail when they give a like for a product. Black Friday – This is one of those triggers that can help you sell even more on special occasions,such as Black Friday. It recommends the products with the greatest discount for every user. Wishlist –Well, everybody has one, right? And everybody adds product in their wishlist, hoping that one day they will get them, right? This trigger offers the desired products at great prices and makes the users add them to the cart before others do it! This is the reason everybody loves retargeting! This is pretty much it. We must admit that we’re pretty hyped about our new retargeting platform and above you can see why. What do you think about Retargeting.Biz, this unique retargeting tool that helps online businesses sell more? Tell us your first impressions, using the comments section below! Make it less a transaction, more an experience! Get CONTAGIOUS… with Viral Content!